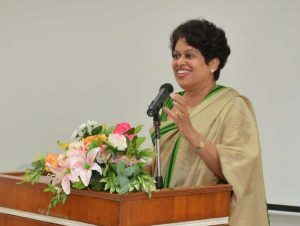 Ambassador of Sri Lanka to Thailand, H.E. Mrs. Kshenuka Dhireni Senewiratne, presided over the conclusion ceremony of the Professional Development Training Program on Leadership in Agricultural Research Management. Ambassador of Sri Lanka to Thailand, H.E. Mrs. Kshenuka Dhireni Senewiratne at AIT on 8 June 2018. Addressing the participants from Sri Lanka, Ambassador Senewiratne stated that the training program addressed two key areas of focus of the Government in Sri Lanka - development of the agricultural sector, and capacity building of government employees. 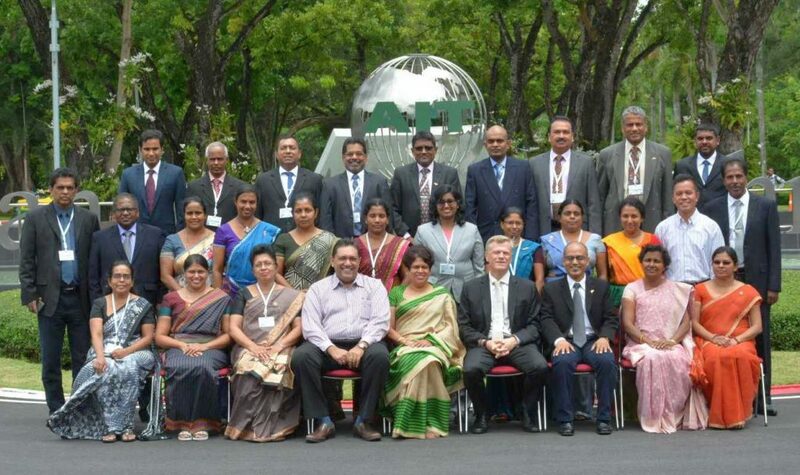 Thanking AIT Extension for developing a Leadership Program in Agricultural Research Management, the Sri Lankan Ambassador said that both Thailand and Sri Lanka can work together as partners in the area of agriculture and food production. Dr. Jonathan Shaw, Executive Director, AIT Extension, spoke about the technological advancements made in Thailand in the field of agricultural research and management. Quoting examples of agricultural innovation and post-harvest technologies, he spoke about emerging opportunities in reducing inefficiencies in the agricultural sector. Mr. Sanjeev Jayasinghe, Director, Office of Advancement, highlighted the relationship between AIT and Sri Lanka. With 1409 AIT graduate alumni and thousands of short term trainee participants, Sri Lanka represent the third largest cohort after Thailand and Vietnam. Dr. Zakir Hossain () of AIT Extension, who led the 10-day program for 24 officials from Sri Lanka, stated that participants learnt about leadership, effective research project management, team building, conflict management, and communication and negotiation skills that are key to creating an innovative agricultural research system. The USAID-World Bank funded program brought participants from various Sri Lankan organizations including the Field Crops Research and Development Institute, Plant Genetic Resources Centre, Seed Certification Service, Horticultural Crops Research and Development Institute, Fruit Research and Development Institute, Plant Virus Indexing Centre, Palmyrah Research Institute, Sugarcane Research Institute, Rubber Research Institute of Sri Lanka, Forest Research Centre, Coconut Research Institute, Tea Research Institute of Sri Lanka, Hector Kobbekaduwa Agrarian Research and Training Institute, Sri Lanka Council for Agricultural Research Policy, Department of Animal Production and Health, National Cinnamon Research and Training Center, Institute of Post-Harvest Technology, National Aquatic Resources Research & Development Agency, Department of National Botanical Gardens, and Ministry of Agriculture. Professional Development Training Program on Leadership in Agricultural Research Management organized at the Asian Institute of Technology.